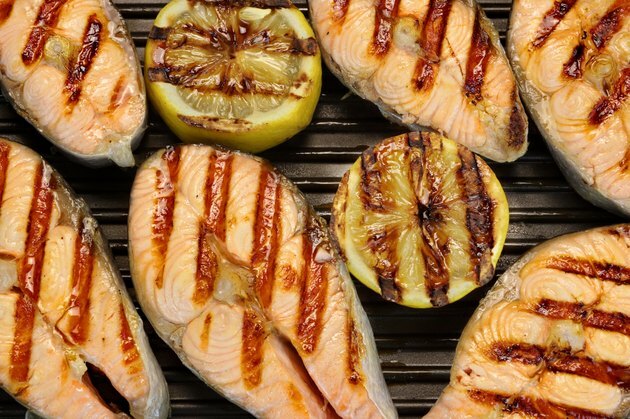 Grilled salmon steaks or fillets are a heart-healthy basis for any meal. Salmon is high in omega-3 fatty acids, which help lower levels of low-density lipoproteins, or LDLs, in your blood. It takes a very short time to grill salmon fillets or steaks, making them a good choice for busy households. Grilling salmon indoors is not complicated or difficult, and it’s a good way to have the flavor and nutrition of salmon year-round. Run your salmon under a cool trickle of water to rinse away any stray scales or bits of skin. Blot the fish with paper towels. Sprinkle the tops of the salmon with a squeeze of lemon juice and season it with salt and pepper or your favorite seasonings. Salmon’s mild flavor goes well with almost any herb or spice. Coat your indoor grill’s rack with nonstick cooking spray. This keeps the salmon from sticking and makes cleaning up easier. Turn the indoor grill on to medium and let it heat up. Set the salmon on the hot grill, skin side down if it’s a fillet with the skin still on. Let the salmon cook for 10 minutes per each inch of thickness, divided by two. So, let a 1-inch-thick salmon steak or fillet cook for five minutes. The timing doesn’t have to be exact; this is just a good rule of thumb. Turn the salmon carefully with a pancake turner. Sprinkle the top with lemon juice, salt, pepper and seasonings and let it cook for another five minutes. Check the salmon for doneness by probing the fish with a fork. It is done when it is opaque all the way through and it flakes easily. Brush your salmon with olive oil before and during cooking for a slightly crispy outside. Never spray nonstick cooking spray onto a grill with the heat source turned on.